When Hakon was a child he was sent to England into King Athelstan’s court where he was raised as a Christian. When his father Harald Fairhair dies, Hakon is sent back to home to capture the throne from his bloodthirsty brother Eric Bloodaxe. Being a Christian amidst the pagans, he was viewed with suspicion. He was horrified by the Viking practice of human sacrifice but knew he needed allies if he wanted the crown so he couldn’t protest too much. There were battles, blood and action and the story moved quickly. 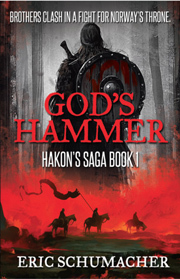 At first, Hakon was young, naïve, arrogant and lost among the Vikings after living so long away. He needs to learn how to be a Viking again to get support. At times I got the feeling he would have wanted to stay in England. It was very enjoyable to read and I can’t wait to learn how he manages to hold on to the crown.